Dragon Door: Did you originally try kettlebells because of your martial arts studies? Phil Ross: I'm always looking for the best things available as far as training goes, especially concerning martial arts. I first heard about kettlebells at Frank Shamrock's place in the Summer of 2005. He mentioned that he knew someone in San Jose who was training with these cool things called kettlebells. So, he showed me a few moves at his studio in San Jose and I thought they looked interesting. Then, one of my clients, Dr. Pat Roth—a very notable neural surgeon who operated on Rutgers football player Eric LaGrande—told me about Steve Freides. Steve had recently explained to Pat how kettlebells helped to cure his back. I just kept hearing a lot about kettlebells, so I went online, bought a set from Power Systems along with the Steve Cotter Encyclopedia of Kettlebell Lifting. I researched a little deeper and discovered that Pavel and the RKC were the "Gold Standard" for kettlebell training and certifications. From there I found Dragon Door and signed up to test for the RKC. I attended the 3 day workshop in October, 2007 and became RKC certified. Dragon Door: Was your interest in kettlebells mostly personal at this point, or were you beginning to use them with your clients and martial arts students? Phil Ross: I wanted to learn as much as possible, so I started buying more videos like Enter the Kettlebell. I started training myself, because there weren't too many available instructors yet. Steve was nearby, but our schedules didn't work, and I was busy teaching at my own studio. I started adding kettlebells in some of my advanced classes, and with my advanced martial arts students—wrestlers and fighters—who either wanted to take it to the next level, or were competing. After I got my RKC certification, I started a kettlebell-only class. Now I'm running eleven kettlebell classes a week. Every Saturday morning, I have a training class especially for our certified instructors. Seven people at my studio are certified HKCs and have been training with me for quite a while. Dragon Door: In your opinion, what are some of the best kettlebell exercises for martial artists? Phil Ross: I like alternating cleans, swings, snatches, and any squatting motion—there are so many different squats we can do. I also like push presses for martial arts. Dragon Door: What benefits have you experienced from kettlebell training? Phil Ross: First of all, learning about kettlebells has expanded my own training knowledge to an incredible degree. Physically—even though I just turned 50—I'm in much better condition now, far superior to when I was simply weight training. Luckily, I was always into bodyweight training at some level, but incorporating kettlebells has just really made me strong to the bone. It’s enabled me to keep going as I get older. I have had over 300 fights (a low estimate), and injuries accumulate, but kettlebell training has helped me keep going and enabled me to keep training. Dragon Door: Very cool. When we talked earlier, you mentioned some issues with your knees, has kettlebell training helped? Phil Ross: Yes. On Saturday, I was single rack squatting with the Beast for sets of 5 reps. It’s helped me a lot. I've had knee surgery, and currently have a torn meniscus and a torn quad tendon, but I'm healing with kettlebells. I'm not going to have another operation; I'm just training the knee and restoring it. On the injured side, I can already do a body weight pistol squat, and the single rack squats mentioned earlier. Dragon Door: Are you still competing in martial arts? Phil Ross: I had an injury requiring an operation on four levels of my neck in December, 2011. My doctors told me not to compete anymore, but prior to that my last competition was in NAGA, the North American Grappling Association. 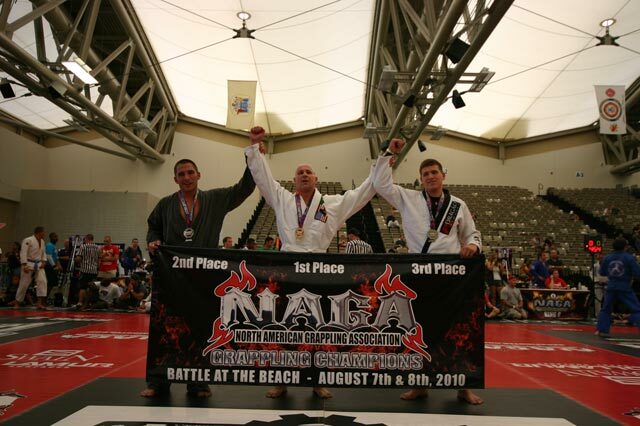 I had won the Battle of the Beach, a nationally rated tournament in 2010. I was almost 48 and had five fights in that tournament. I went undefeated with no one scoring against me. I competed in both the 40 and up division and the 18-29 division, and actually won a title belt for the expert division. Dragon Door: It’s impressive that you were able to compete against athletes of all ages. Phil Ross: Yes, I would say weighing in at 184, I was definitely stronger than all but one other competitor who was 200lbs. He was huge! I was able to wear him out a little bit though, because my endurance was pretty good. Dragon Door: You've been recently promoted to Master RKC, what do you see yourself doing next with kettlebells? Phil Ross: I want to bring my knowledge and experience to the RKC and the Dragon Door community. I won't be reinventing the wheel, but want to bring some nuances that will enhance our community’s training, especially for group training. Since I teach martial arts, I'm used to having people at different skill levels all in the same class. I might have a black belt and a white belt training side by side, but they could be doing different things. The same thing happens in my kettlebell classes, some students have been with me for five years, and some for just a few days. As a martial arts instructor as well as a kettlebell instructor, I've developed the ability to train people of different levels in the same class. In an ideal world, we’d all have one-on-one sessions, or everyone in a class would be at the same stage in their training. But that's not going to happen and there are only so many hours in a day. Dragon Door: What's a favorite strategy for working with a mixed-level group class? Phil Ross: I've created a collection of over 150 different workouts, and have filmed 104 of them, which are in editing right now. The project is called the Kettlebell Workout Library. It's going to be a great training tool, especially for instructors who will be able to help a new student on one workout, while having an intermediate and advanced student do two other workouts. I can have several different workouts going on at once in the same class by referencing the manual accompanying the video series. I've been working on the system by logging my routines, ever since I started training with kettlebells. Dragon Door: That’s excellent. I remember the last time we talked, you mentioned a comic book project. Phil Ross: A buddy of mine is Joe Antonacci, who was just inducted into the boxing hall of fame for his work as a ring announcer for Friday Night Fights on ESPN, HBO, fights in Atlantic City, and more. He purchased Joe Palooka, a comic book from the ’40s and ‘50s about a boxer. He's now reinvented Joe Palooka as a mixed martial artist. Joe Antonacci enlisted me to collaborate on all the fight scenes. Mike Bullock is the prize winning comic book writer on the project, but they've brought me in as a specialist to help him make the fights appear realistic. Mike will ask me how a fight between Joe Palooka and a capoeira guy would go for example. Mike tells me who will win beforehand and I lay out the whole sequence of the fight so that it makes sense. In fact, UFC Magazine did a write up on the comic book series asked us how we make the fight scenes in the comic book so realistic, then they dedicated two paragraphs to me. Right now, two issues of the comic are out, but we were recently purchased by IDW—the same company who brought GI Joe to the silver screen. So, they might be looking to do something similar with Joe Palooka. In issue five or six, I might be introduced as a character—a trainer with my kettlebell and RKC shirt. I’ve got to make sure that happens. Dragon Door: We'll definitely need to see that. You have a lot of exciting things going on, especially with the new RKC. Phil Ross: I'm really excited about the new RKC. I think we’re putting together an excellent team—Max Shank, Andrew Read, and of course Andrea Du Cane. New leadership announcements are happening all the time, and everyone's top shelf. I don’t have any complaints about the old RKC, I just think we can continue to make the system even better. I'm glad to be part of it. Dragon Door: What other experiences are you bringing to your leadership position? Phil Ross: I also have some experience with powerlifting. I'm not hugely involved in it, but did compete up until 1987 where I clean benched 370lbs with a pause at at a body weight of 179.9 lbs. I also achieved a 525lb squat, and 505lb deadlift at the same event. Powerlifting gave me a lot of perspective. I also won some Olympic lifting contests and bodybuilding contests too. I left bodybuilding because to me, training is all about health and sports, so I wasn't going to use steroids to get bigger just to win the next contest. Dragon Door: In addition to your studio you're also doing online-based training? Phil Ross: Yes, I've put together a very low cost beginner's kettlebell training program, available at KettlebellKing.com. 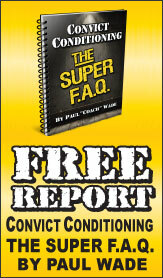 It has three technique sections, two warm-up and bodyweight sections, along with twelve beginner kettlebell workouts. There’s also an electronic manual included which is based on a program I put together for NASM. Dragon Door: What inspired you to create the program? Phil Ross: I want to reach as many people as possible since everyone can't come to New Jersey and train in my studio. It's also good for people who are still researching kettlebells before making a big commitment like an RKC Workshop. I wanted to make a way for people to get a solid base of knowledge, along with something to practice and reference. It will give them an idea of what they’re getting into, and the benefits that they can expect. I'm certain that once they go and practice the program for a few months, they’ll be started for life. After 90 days they'll see the benefits. Something else I'm bringing to the RKC is my Fit to Fight program, it’s based on my SAVE (Surviving A Violent Environment) program. SAVE is a self defense fitness program which was rated number one several times by independent video reviewers, actually beating out Krav Maga, and Dillman’s pressure point system. It has its own certification process, and I just finished teaching it to a group of phys ed teachers at one of the local high schools. They're going to use it as a unit for their phys ed classes. The Fit 2 Fight concept is based on martial arts self defense movements coupled with bodyweight exercises. Max Shank and I are collaborating on this project, I'm providing the martial arts techniques and he's supplying the bodyweight exercises and associated regimens. Dragon Door: That's very exciting, and we're all looking forward to see how you bring your unique style to your new leadership role. Phil Ross: I can’t wait to lead my first RKC Certification Workshop, I think it's a great opportunity. In the past five plus years, I’ve put a lot into training with kettlebells. I'm looking forward to see who else is going to be with the RKC and how we all develop it even further.